It's "anchors away!" for the Cupcake Club! Jenna's stepdad Leo is taking his family on a Caribbean cruise. Unfortunately, Jenna's younger siblings get the chicken pox, leaving Leo with four extra tickets. Enter Peace, Love, and Cupcakes! Leo says Jenna's four besties can come-in exchange for baking twelve thousand cupcakes for his company's pirate-themed event. Shiver me timbers, that's a lot of icing! Now veterans in the cupcake-baking game, the PLC takes on the challenge. But when a freak rainstorm flares up on the night of the big event, will it be rough seas for the girls? Sheryl Berk, New York Times bestselling coauthor of Soul Surfer, and her daughter Carrie, a cupcake connoisseur who has reviewed confections from around the world in her Carrie's Cupcakes Critiques newsletter, have cooked up a delightful series sure to be a treat. This is another installment of the The Cupcake Club and it finds the girls vying for a Caribbean cruise in exchange for a literal boat-load of cupcakes. In this book, we hear from Jenna! Jenna's step-dad Leo has the exciting news that the entire family can go on a cruise for his job, but then the chicken pox hits the family. Well, since the family is sick Leo makes a deal with Jenna that if Peace, Love, and Cupcakes crew can make 12,000 cupcakes then they can come on the cruise! Now the girls on a baking frenzy and spending all their time in the kitchen! 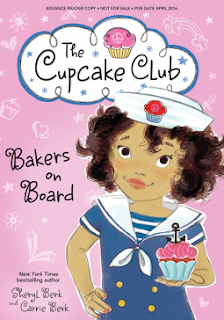 Can the Cupcake Club bake on the high seas? Or will their cupcakes go from sweet to sunk? Purchase Bakers on Board (paperback) on Amazon for $7.65 + FREE Shipping on orders with at least $25 of books.